Spring measurements and spring specifications for compression, extension and 'torsion' springs are below. Follow the guidelines below for the type of spring you have to determine your springs measurements and spring specifications. The last coil is closed touching the previous coil closed and squared ends is the most economical of all end types and works well for standing up normal size springs. Closed and squared ends do NOT work well if you have a spring with a small outer diameter you should choose closed and ground ends so it will stand up vertically straight. The last coil is closed and ground flat touching with the previous coil. Closed and ground ends help the spring stand up vertically straight. This type of end lets your spring stand up straight and gives an even surface of contact to the spring base. A good choice for precision springs though a bit more costly than closed and squared ends because additional labor needs to be performed to grind the ends of the spring flat. The last two coils on each end are closed to help stabilize the top and bottom of the spring. Double closed ends aids your springs footing especially when you have a large outer diameter coupled with a fine or smaller diameter wire when compressing or traveling to stacked height where all the coils are touching. Double closed ends help your spring ends from sliding over or slipping under the previous coil, it keeps the coils stacked up on top of each other correctly. This is an great economical choice to prevent buckling and stabilizes your spring. The ends of the spring are open and have space or pitch in-between them. This is a good option if you need more force out of your spring but don't have the room for it. An open ended spring makes all of your coils active thus getting the all the force out it. This kind of spring end requires that you place it in hole or on a shaft to make it work. Their is usually no extra cost for this type of end thus making it an economical choice. 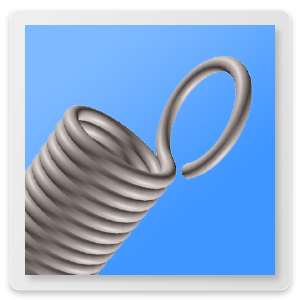 To measure your Helical Springs Rate or Spring Constant use our Spring Calculator here. A good standard hook choice for commercial springs. This hook is made from the end coils on the spring by bending it out to create this hook. Machine hooks should not be stretched over their limit to avoid breakage. A great standard hook choice for precision springs and commercial springs. This type of hook is made from the end coils of the spring but is bent straight down the center of the spring, it then loops around to create the round hook. This is a more stable hook than the machine hook for the same price. The most economical of all hooks is the side hook. This hook is made from the end coils. It is bent outwards from the side of the spring to create the side hooks. 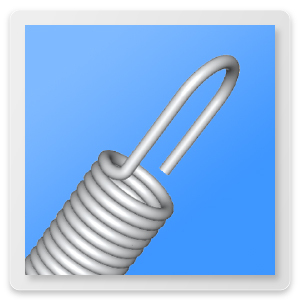 This is a good hook for an commercial or everyday spring which doesn't have to be precise. This type of no hook spring is very useful when inserting a bolt down through the inner diameter so to anchor the spring ends. 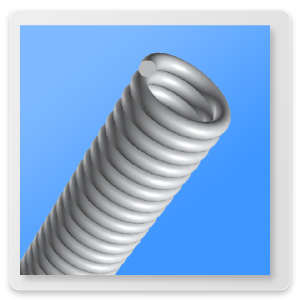 The ends of the spring act as threading onto the threads of the bolt thus securing the ends. This type of fastening or connecting has tremendous benefits especially when dealing with broken hooks that cause a user to purchase extension springs repeatedly. 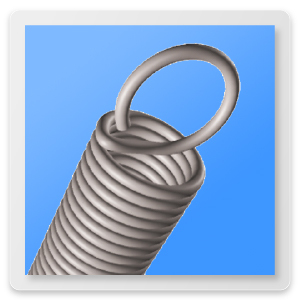 Fastening the spring to a bolt or a thread offers superior strength versus any other hook type and is the most economical to manufacture. This is a good hook that is used when having to get around an object to engage the hook too. It offers the user a way to get the hooks fastened by extending the length of the hook to reach into the area where one will attached the hook. Extended hooks can be made with larger or smaller diameters than the extension springs normal outer body diameter. This type of hook is the most costly but can really make the difference when installing an extension spring where no other hook will work. To measure your Extension Springs Rate or Extension Spring Constant use our extension spring calculator here. Please see diagram to the right to determine if your spring is Left hand or Right hand. If your spring has any bends or shapes on the legs please let us know. To measure your Torsion Springs Rate or Torsion Spring Constant use our torsion spring calculator here.